I received many great comments yesterday after speaking at Grace College in Indiana—at chapel in the morning and then a public meeting in a different auditorium at night. Actually, I have heard this comment many times before from Christian leaders who have told me they so appreciate our boldness and the authority with which we teach—and the information given through the ministry; observing how we teach at AiG has stimulated them to be more bold in standing on the authority of the Lord. As the pastor yesterday said, “It makes us realize we are not a lone voice, and there are others standing solidly on God’s Word,” etc. 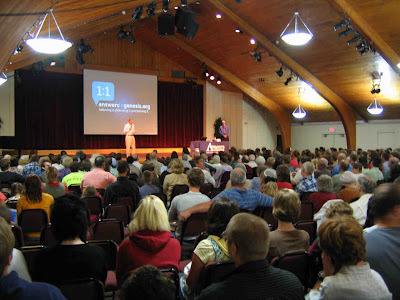 I have included four photographs of the meetings: two were taken in the auditorium at Grace College for the morning chapel. The other two were taken in the Rodeheaver Auditorium—one shows Grace professor Dr. Don DeYoung introducing me, the other is of me as I began speaking. Dr. DeYoung is a long time friend (going back 20 years) and a good friend of AiG.